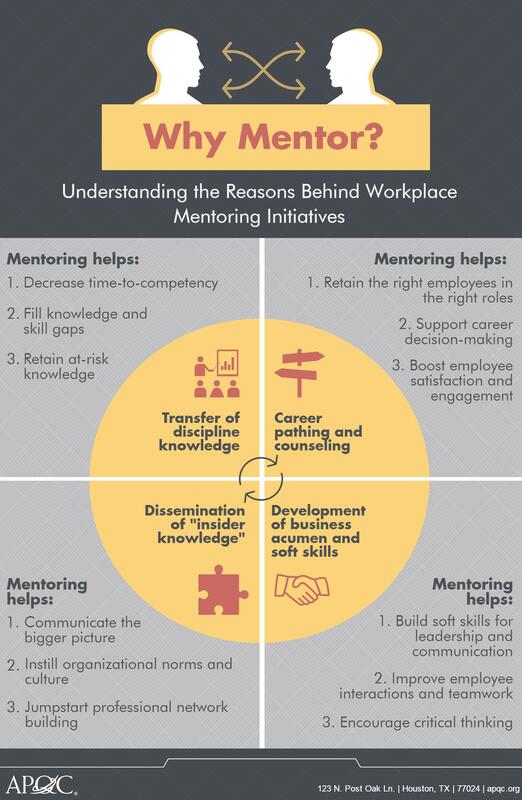 When I started scoping APQC’s Workplace Mentoring study, I thought I understood why organizations encourage employees to mentor and be mentored. First, mentoring is an inexpensive way to build employee skills and competencies so that they can become high performers and move up the ranks. Second, the mentoring experience makes mentees feel nurtured and valued—and thus more likely to stay with their current employers. While these are common (and extremely valid) reasons to pursue a formal mentoring program, our research showed me that things are a little more complicated. In conducting the research, we saw nearly every possible mentoring variation on display: highly structured and organic programs, one-on-one pairings and group structures, short- and long-term relationships, and face-to-face and virtual interactions. At first, it was hard to make sense of all this diversity. Why were organizations going in so many directions when it came to mentoring, and how were such contradictory strategies yielding positive results? the dissemination of “insider knowledge” about an organization’s structure, norms, culture, and professional networks. While some programs aimed to cover all four categories, most zeroed in on one or two that the organization considered particularly important. And that narrowing of focus had serious implications for the program’s design and structure. For example, mentorships that emphasize career pathing and counseling tend to be at least six months long so that pairs have time to build trust, whereas soft-skills mentoring is well-suited to short-term and group mentoring structures. Career counseling can be just as effective over Skype as it is in person, but it was usually better for mentors and mentees transferring job-specific knowledge to be in the same place so they could work side-by-side. And programs designed to disseminate insider knowledge usually incorporate face-to-face networking events to help participants make connections and build relationships beyond their specific mentor pairings. What’s the purpose behind mentoring at your organization, and what type of program works best for you? Let me know in the comments—or check out the infographic below for more information on the four categories. See the full results of this research (including a high-resolution version of the infographic) in the Workplace Mentoring for Technical and Nontechnical Audiences Collection.